NEET 2018 Exam conducted successfully on 6 May at 2255 centres in 136 cities across India. As per reliable sources, approximately 13 lakhs candidates appeared in NEET 2018 which held in 11 languages including newly added language, Urdu. Not to repeat the leak of question paper, CBSE followed the instruction released by Supreme Court and in resultant all the candidates went through strict check-post before writing NEET today. Another big thing has been noticed is the steep hike in the number of candidates registered for NEET 2018, compared to NEET 2017, the number of students surprisingly increased by 2 lakhs. National Eligibility Entrance Test (NEET) is utmost entrance exam in India in which candidates compete for admission in MBBS and BDS courses in Top Colleges in India. Approximately 90,000 seats (65,000 MBBS and 25,000 BDS) will be filled on the basis of NEET score in various colleges, institute, and university including Government and Private colleges. Another change came when at the last moment, 10 centres updated with the new address. To read more about Changes in NEET 2018, click on the link below. 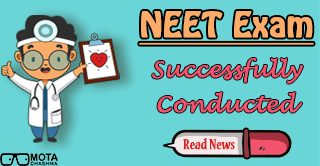 NEET 2018 – How it Happened? NEET 2018 started with the chaos as at the examination centres, parents and guardian were more in numbers comparatively. Since the strict administration has been in charge, items such as geometry/pencil box, calculator, pouch, and pen drives, log table and electronic devices like phones, Bluetooth, health band, transistor, capacitor, diode, triodes are barred, parents and guardian waited outside to hold these items. In addition, candidates were also not allowed to bring water bottles, wallet, handbag, belt, cap, ATM/Credit/Debit Card, watch etc. Students were even prohibited to wear shoes. However, a lot of candidates unaware of the barred items wearing jewelry and shoes and hanker chips were spotted at outside various centres. NEET 2017 vs. NEET 2018 – Highlights of Changes! National Eligibility Entrance Test (NEET) is the utmost exam for admission into MBBS and BDS courses. Over the year, a lot of figures changed and we are giving you an insight view on NEET in the current and last year. Last year, a total of 6,11,539 students qualified NEET, out of which 2,66,221 were male, 3,45,313 were females and 5 were transgender. This year, we have seen the change in numbers in all figures as approximately 2 lakhs students are added in the previous number who registered for NEET last year and this leads to increase the no. of exam centres as well. CBSE is conducting NEET last time as it is officially announced that from the nest session National Testing Agency (NTA) will be the conducting body of many major entrance exams including NEET. Thus, with a new conducting body, medical aspirants can expect changes in NEET 2019. NEET 2018 – What is Next? Students appeared in NEET 2018 are now looking for Answer Key, which is definitely the next move to tally their marks to know about their performance. There are lots of private institutes who release NEET Answer Key on the same day of exam commenced. Therefore, candidates can tally their marks by following the link given below.